In fact, if you want an immersive travel experience, you should probably book right now—because the travel site Lonely Planet just named Colombia the second best country to visit. Which means an influx of tourists looking for an unforgettable vacation in the only South American country to make the list. Still not convinced that Colombia is right for you? Check out these unique experiences you can only find in this remarkable, wild, and relentlessly charming country. 1. Step into the world of Gabriel Garcia Marquez in Ciudad Amurallada, the ancient “walled city” of Cartagena. When you think of romantic Colombia, Ciudad Amurallada should definitely come to mind. If you love the Garcia Marquez novels, you’ll recognize glimpses of his home town. The old walled city, with its palm-lined plazas and pastel architecture, is a lovely place to explore—especially by horse-drawn carriage. 2. Get your Caribbean fix at Parque Tayrona. Although the tourists flock to Cabo San Juan, there are gorgeous, secluded beaches nestled in the foothills of the Sierra Nevada mountains. Spectacular stretches of sand, turquoise sea, and breathtaking, instagram-worthy views of the jungle covered mountains—you’ll love Cañaveral Beach. Looking for boutique beach experience? Plan a stay at one of the idyllic ecohabs near the park. Enjoy a bit of adventure (think scuba, tubings, even horseback riding) if that’s your jam, or just while away your afternoons in a hammock on the beach. 3. Party time! Check out the Cartagena nightlife on a chiva tour. You haven’t done Cartagena until you’ve toured the city on a chiva. Picture a colorful open-sided bus with a live band playing vallenato and an open bar serving endless rum and Cokes and tasty fried treats and you’re beginning to get the idea behind the chiva tour. 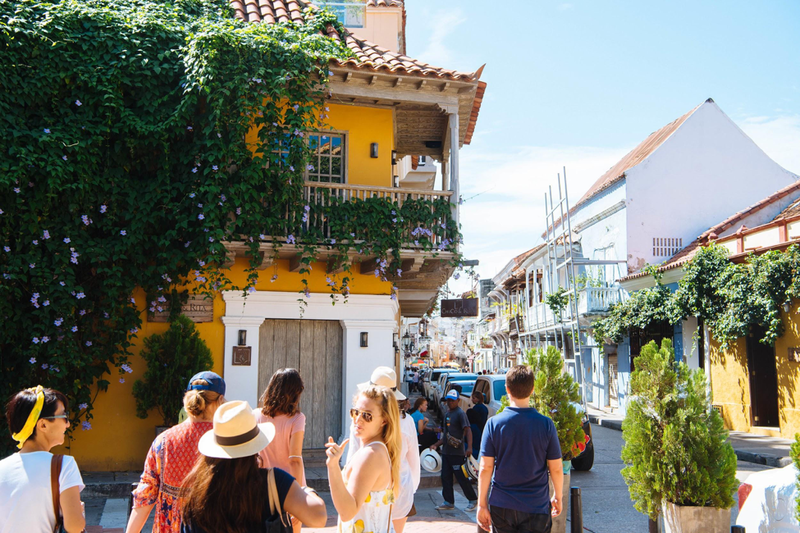 It’s a quintessential Cartagena experience—and there’s really no better way to immerse yourself in the city’s culture and joie de vivre. 4. Ceviche, langosta, paletas—the food scene in Cartagena is to-die-for. Cartagena is fast becoming a culinary destination in its own right—for good reason. This colonial port town blends the best of Latin American and Caribbean cuisine into some mouthwatering creations featuring fabulously fresh seafood and colorful produce. Sample the succulent ceviche, the luscious langoustine, and paletas, the artisanal popsicles that pop with fruity flavors. 5. Yes, the Cartagena Mud Volcano really is a thing. If you loved mudpies and puddles as a child—well, El Totumo is definitely the place for you. Take a float (yes, you really do float!) on the warm, silky, therapeutic mud. The grayish goo is a healthy blend of skin-soothing minerals like calcium and magnesium; you’ll feel like a new man or woman after your soak. 6. You haven’t danced until you’ve lost yourself in champeta. Champeta is Cartagena’s signature Afro-Colombian dance music—it sets your pulses racing and your body flailing with abandon to the beat. It’s instantly recognizable by the African guitar rhythms and distinct structure. Champeta begins with an intro and chorus, and builds to a frenetic conclusion called el Despeluque, which, fittingly, roughly translates to “messy hair.” Don’t say you weren’t warned. 7. Gorge on bandeja paisa, Colombia’s national dish, in Medellin. 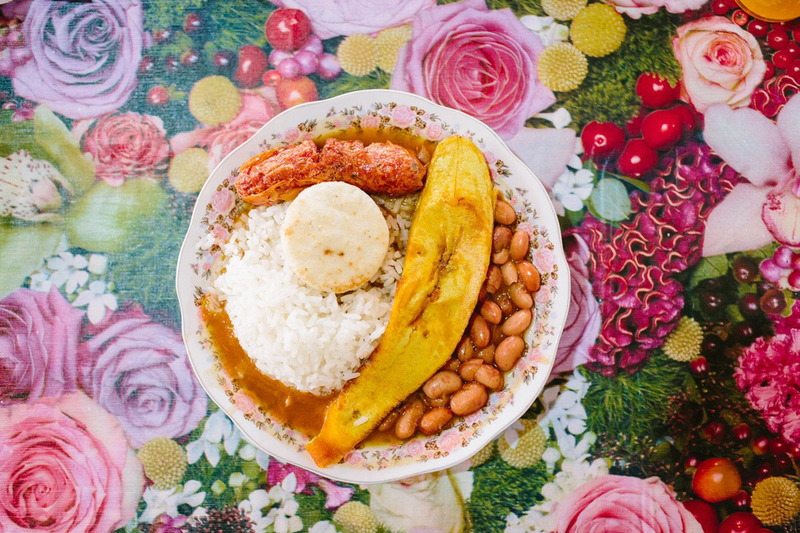 This delectable dinner’s origins can be found in the coffee growing region in Colombia. Farmers would eat this before they went out to work for the day, as they knew it would give them enough fuel to keep going until they returned home. Bandeja paisa is unsurprisingly hearty and huge. It’s packed with proteins and carbs—not for the faint at heart. Picture a pile of chorizo, morcilla, and chicharron, studded with rice, beans, arepa, and garnished with avocado, fried egg, and corn. Some call it a heart attack on a plate—but that doesn’t mean you shouldn’t try it. Live large on your Colombian vacation! 8. Take the best (and cheapest!) city sightseeing tour on the Metrocable. Medellin has completely transformed itself in the decades since its violent past —and at the core of its urban renaissance is its modern public transportation system. The Metrocable is an engineering marvel that connects the valley, where Medellin sits, with the communities further up the mountain. The elevated system is incredibly cheap and offers amazing views of the city—you can have the most authentic and complete sightseeing tour of Medellin for around $1. Do you want to lose yourself in the beautiful flora and fauna of Parque Arvi? You’ve done Tayrona, but you owe it to yourself to see another of Colombia’s amazing parks, which you can get to via the metrocable. You’ll feel like you stepped into a whole new world. 9. Fall in love with Fernando Botero sculpture. Do you know Boterismo? It’s the signature style of the figurative artist and sculptor Fernando Botero. If you do, you’ll fall in love with Plaza Botero, one of the most popular attractions in Colombia, where you can see for yourself the chunky, full-figured people who characterize Botero’s works. If you don’t, you’ll still want to spend some time here in the lovely park near the front of the Museo de Antioquia. There are 23 iconic sculptures by the Colombian master himself, one of which is sure to stir your soul. 10. Practice your salsa moves in El Poblado. South America is the birthplace of salsa—and no one does it better than the people of Medellin. The lively neighborhood of El Poblado is the best place to take a few lessons and then try out your skills at one of Medellin’s discotecas (dance clubs). 11. It’s definitely possible Guatapé is the most colorful town in the world. Guatapé takes its name from Embalse Guatapé, a lovely lake just two hours from Medellin. Its claim to fame is its brilliantly colored buildings and fabulous frescoes. Forget peaceful pastels—Guatapé’s hues are bold and technicolor, a screaming melange of vivid purples, greens, yellows, and blues. Its sweeping lake district views are just the icing on the cake. 12. 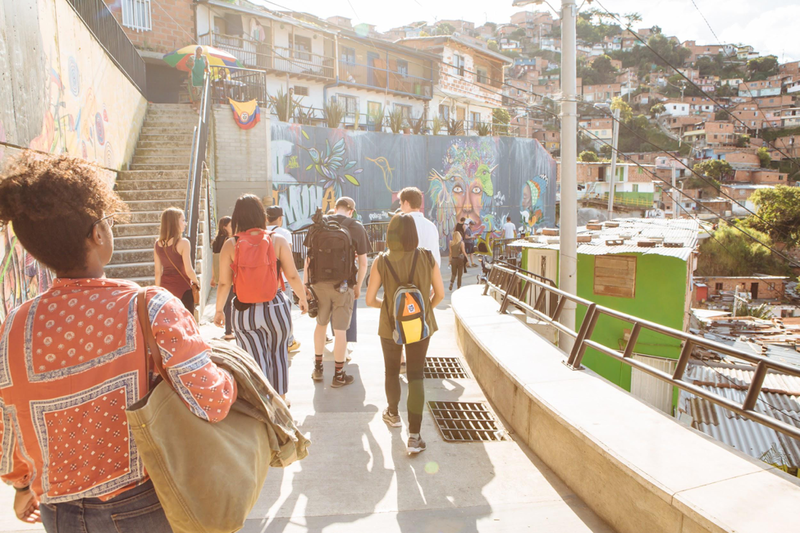 Visit Comuna 13 to understand the transformation Colombia has undergone. A pinnacle feature of the area is the escaleras electricas, the outdoor escalators adorned in colorful graffiti, that now connect the previously isolated barrios to the city below. A visit to Comuna 13 will be filled with thought and contemplation, as you unravel the stories of the neighborhood. 13. Indulge your inner epicure in Medellin’s fabulous food scene. The City of Eternal Spring is also Latin America’s hottest culinary destination. From the street food near Plaza de Botero to the chic bistros in Poblado, you’ll find something fresh and flavorful to tempt your palate. Truly adventurous foodies won’t want to miss El Cielo, a farm-to-fork restaurant featuring molecular cuisine. Or if you prefer to dine with the butterflies, birds, and iguanas, enjoy a one-of-a-kind lunch experience at In Situ, located in the heart Medellin’s Botanical Gardens. START PLANNING YOUR COLOMBIA TRIP NOW! Are you ready to embrace Colombian culture? We’d love to have you along for the ride. Get in touch today to start planning the trip of a lifetime.